Place basil and garlic into a pestle, and mash it all up. Add olive oil and mash some more to make the pesto (note: you can also use a food processor). Season the pesto with salt. Grill the English muffins, cut side down, over low heat, until just soft, about 30 seconds. Turn and grill until the muffins start to brown, about 1 minute. Spread the cut sides of the muffins with the pesto. Layer 1 slice of cheese, 2 zucchini pieces and 1 more slice of cheese on the bottom halves of each muffin. Close the sandwiches and brush the tops and bottoms with olive oil. Grill the sandwiches over low heat, turning, until they’re crisp on the outside and the cheese is melted, about 4 minutes total. Cut the sandwiches in half and serve right away. 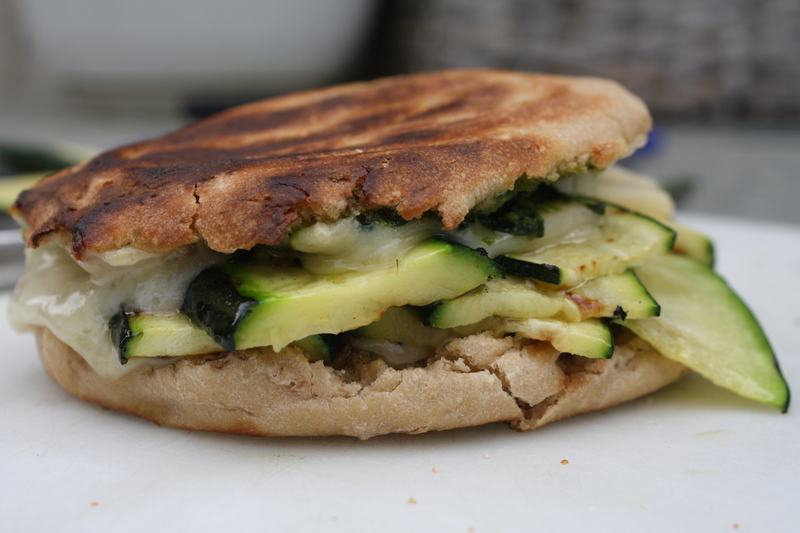 This entry was posted in cheese, grilled, sandwiches, vegetables and tagged cheese, English muffin, food photography, grill, gruyere, pesto, summer, vegetarian, zucchini by Laura Zolnoski. Bookmark the permalink.